196:0.1 JESUS enjoyed a sublime and wholehearted faith in God. He experienced the ordinary ups and downs of mortal existence, but he never religiously doubted the certainty of God's watchcare and guidance. His faith was the outgrowth of the insight born of the activity of the divine presence, his indwelling Adjuster. His faith was neither traditional nor merely intellectual; it was wholly personal and purely spiritual. 196:0.2 The human Jesus saw God as being holy, just, and great, as well as being true, beautiful, and good. 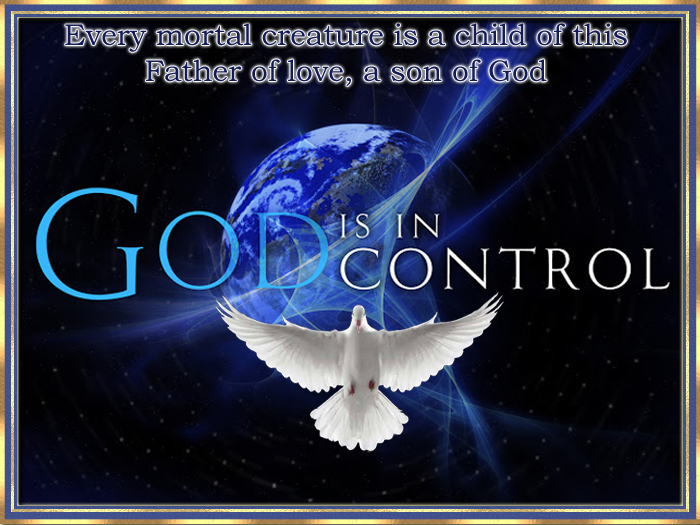 All these attributes of divinity he focused in his mind as the "will of the Father in heaven." Jesus' God was at one and the same time "The Holy One of Israel" and "The living and loving Father in heaven." The concept of God as a Father was not original with Jesus, but he exalted and elevated the idea into a sublime experience by achieving a new revelation of God and by proclaiming that every mortal creature is a child of this Father of love, a son of God. 196:0.3 Jesus did not cling to faith in God as would a struggling soul at war with the universe and at death grips with a hostile and sinful world; he did not resort to faith merely as a consolation in the midst of difficulties or as a comfort in threatened despair; faith was not just an illusory compensation for the unpleasant realities and the sorrows of living. In the very face of all the natural difficulties and the temporal contradictions of mortal existence, he experienced the tranquillity of supreme and unquestioned trust in God and felt the tremendous thrill of living, by faith, in the very presence of the heavenly Father. And this triumphant faith was a living experience of actual spirit attainment. Jesus' great contribution to the values of human experience was not that he revealed so many new ideas about the Father in heaven, but rather that he so magnificently and humanly demonstrated a new and higher type of living faith in God. Never on all the worlds of this universe, in the life of any one mortal, did God ever become such a living reality as in the human experience of Jesus of Nazareth. 196:0.4 In the Master's life on Urantia, this and all other worlds of the local creation discover a new and higher type of religion, religion based on personal spiritual relations with the Universal Father and wholly validated by the supreme authority of genuine personal experience. This living faith of Jesus was more than an intellectual reflection, and it was not a mystic meditation. 196:0.5 Theology may fix, formulate, define, and dogmatize faith, but in the human life of Jesus faith was personal, living, original, spontaneous, and purely spiritual. This faith was not reverence for tradition nor a mere intellectual belief which he held as a sacred creed, but rather a sublime experience and a profound conviction which securely held him. His faith was so real and all-encompassing that it absolutely swept away any spiritual doubts and effectively destroyed every conflicting desire. Nothing was able to tear him away from the spiritual anchorage of this fervent, sublime, and undaunted faith. Even in the face of apparent defeat or in the throes of disappointment and threatening despair, he calmly stood in the divine presence free from fear and fully conscious of spiritual invincibility. Jesus enjoyed the invigorating assurance of the possession of unflinching faith, and in each of life's trying situations he unfailingly exhibited an unquestioning loyalty to the Father's will. And this superb faith was undaunted even by the cruel and crushing threat of an ignominious death. 196:0.7 The all-consuming and indomitable spiritual faith of Jesus never became fanatical, for it never attempted to run away with his well-balanced intellectual judgments concerning the proportional values of practical and commonplace social, economic, and moral life situations. The Son of Man was a splendidly unified human personality; he was a perfectly endowed divine being; he was also magnificently co-ordinated as a combined human and divine being functioning on earth as a single personality. Always did the Master co-ordinate the faith of the soul with the wisdom-appraisals of seasoned experience. Personal faith, spiritual hope, and moral devotion were always correlated in a matchless religious unity of harmonious association with the keen realization of the reality and sacredness of all human loyalties -- personal honor, family love, religious obligation, social duty, and economic necessity. 196:0.8 The faith of Jesus visualized all spirit values as being found in the kingdom of God; therefore he said, "Seek first the kingdom of heaven." Jesus saw in the advanced and ideal fellowship of the kingdom the achievement and fulfillment of the "will of God." The very heart of the prayer which he taught his disciples was, "Your kingdom come; your will be done." Having thus conceived of the kingdom as comprising the will of God, he devoted himself to the cause of its realization with amazing self-forgetfulness and unbounded enthusiasm. But in all his intense mission and throughout his extraordinary life there never appeared the fury of the fanatic nor the superficial frothiness of the religious egotist. 196:0.9 The Master's entire life was consistently conditioned by this living faith, this sublime religious experience. This spiritual attitude wholly dominated his thinking and feeling, his believing and praying, his teaching and preaching. This personal faith of a son in the certainty and security of the guidance and protection of the heavenly Father imparted to his unique life a profound endowment of spiritual reality. And yet, despite this very deep consciousness of close relationship with divinity, this Galilean, God's Galilean, when addressed as Good Teacher, instantly replied, "Why do you call me good?" When we stand confronted by such splendid self-forgetfulness, we begin to understand how the Universal Father found it possible so fully to manifest himself to him and reveal himself through him to the mortals of the realms. 196:0.10 Jesus brought to God, as a man of the realm, the greatest of all offerings: the consecration and dedication of his own will to the majestic service of doing the divine will. Jesus always and consistently interpreted religion wholly in terms of the Father's will. When you study the career of the Master, as concerns prayer or any other feature of the religious life, look not so much for what he taught as for what he did. Jesus never prayed as a religious duty. To him prayer was a sincere expression of spiritual attitude, a declaration of soul loyalty, a recital of personal devotion, an expression of thanksgiving, an avoidance of emotional tension, a prevention of conflict, an exaltation of intellection, an ennoblement of desire, a vindication of moral decision, an enrichment of thought, an invigoration of higher inclinations, a consecration of impulse, a clarification of viewpoint, a declaration of faith, a transcendental surrender of will, a sublime assertion of confidence, a revelation of courage, the proclamation of discovery, a confession of supreme devotion, the validation of consecration, a technique for the adjustment of difficulties, and the mighty mobilization of the combined soul powers to withstand all human tendencies toward selfishness, evil, and sin. He lived just such a life of prayerful consecration to the doing of his Father's will and ended his life triumphantly with just such a prayer. The secret of his unparalleled religious life was this consciousness of the presence of God; and he attained it by intelligent prayer and sincere worship -- unbroken communion with God -- and not by leadings, voices, visions, or extraordinary religious practices. 196:0.11 In the earthly life of Jesus, religion was a living experience, a direct and personal movement from spiritual reverence to practical righteousness. The faith of Jesus bore the transcendent fruits of the divine spirit. His faith was not immature and credulous like that of a child, but in many ways it did resemble the unsuspecting trust of the child mind. Jesus trusted God much as the child trusts a parent. He had a profound confidence in the universe -- just such a trust as the child has in its parental environment. Jesus' wholehearted faith in the fundamental goodness of the universe very much resembled the child's trust in the security of its earthly surroundings. He depended on the heavenly Father as a child leans upon its earthly parent, and his fervent faith never for one moment doubted the certainty of the heavenly Father's overcare. He was not disturbed seriously by fears, doubts, and skepticism. Unbelief did not inhibit the free and original expression of his life. He combined the stalwart and intelligent courage of a full-grown man with the sincere and trusting optimism of a believing child. His faith grew to such heights of trust that it was devoid of fear. 196:0.12 The faith of Jesus attained the purity of a child's trust. His faith was so absolute and undoubting that it responded to the charm of the contact of fellow beings and to the wonders of the universe. His sense of dependence on the divine was so complete and so confident that it yielded the joy and the assurance of absolute personal security. There was no hesitating pretense in his religious experience. In this giant intellect of the full-grown man the faith of the child reigned supreme in all matters relating to the religious consciousness. It is not strange that he once said, "Except you become as a little child, you shall not enter the kingdom." Notwithstanding that Jesus' faith was childlike, it was in no sense childish. 196:0.13 Jesus does not require his disciples to believe in him but rather to believe with him, believe in the reality of the love of God and in full confidence accept the security of the assurance of sonship with the heavenly Father. The Master desires that all his followers should fully share his transcendent faith. Jesus most touchingly challenged his followers, not only to believe what he believed, but also to believe as he believed. This is the full significance of his one supreme requirement, "Follow me." 196:0.14 Jesus' earthly life was devoted to one great purpose -- doing the Father's will, living the human life religiously and by faith. The faith of Jesus was trusting, like that of a child, but it was wholly free from presumption. He made robust and manly decisions, courageously faced manifold disappointments, resolutely surmounted extraordinary difficulties, and unflinchingly confronted the stern requirements of duty. It required a strong will and an unfailing confidence to believe what Jesus believed and as he believed. 196:1.1 Jesus' devotion to the Father's will and the service of man was even more than mortal decision and human determination; it was a wholehearted consecration of himself to such an unreserved bestowal of love. No matter how great the fact of the sovereignty of Michael, you must not take the human Jesus away from men. The Master has ascended on high as a man, as well as God; he belongs to men; men belong to him. How unfortunate that religion itself should be so misinterpreted as to take the human Jesus away from struggling mortals! 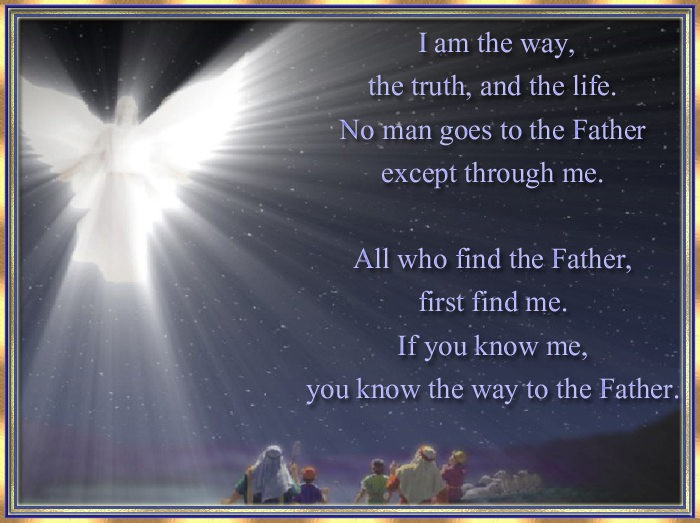 Let not the discussions of the humanity or the divinity of the Christ obscure the saving truth that Jesus of Nazareth was a religious man who, by faith, achieved the knowing and the doing of the will of God; he was the most truly religious man who has ever lived on Urantia. 196:1.2 The time is ripe to witness the figurative resurrection of the human Jesus from his burial tomb amidst the theological traditions and the religious dogmas of nineteen centuries. Jesus of Nazareth must not be longer sacrificed to even the splendid concept of the glorified Christ. What a transcendent service if, through this revelation, the Son of Man should be recovered from the tomb of traditional theology and be presented as the living Jesus to the church that bears his name, and to all other religions! Surely the Christian fellowship of believers will not hesitate to make such adjustments of faith and of practices of living as will enable it to "follow after" the Master in the demonstration of his real life of religious devotion to the doing of his Father's will and of consecration to the unselfish service of man. Do professed Christians fear the exposure of a self-sufficient and unconsecrated fellowship of social respectability and selfish economic maladjustment? Does institutional Christianity fear the possible jeopardy, or even the overthrow, of traditional ecclesiastical authority if the Jesus of Galilee is reinstated in the minds and souls of mortal men as the ideal of personal religious living? Indeed, the social readjustments, the economic transformations, the moral rejuvenations, and the religious revisions of Christian civilization would be drastic and revolutionary if the living religion of Jesus should suddenly supplant the theologic religion about Jesus. 196:1.3 To "follow Jesus" means to personally share his religious faith and to enter into the spirit of the Master's life of unselfish service for man. One of the most important things in human living is to find out what Jesus believed, to discover his ideals, and to strive for the achievement of his exalted life purpose. Of all human knowledge, that which is of greatest value is to know the religious life of Jesus and how he lived it. 196:1.4 The common people heard Jesus gladly, and they will again respond to the presentation of his sincere human life of consecrated religious motivation if such truths shall again be proclaimed to the world. The people heard him gladly because he was one of them, an unpretentious layman; the world's greatest religious teacher was indeed a layman. 196:3.1 Personal, spiritual religious experience is an efficient solvent for most mortal difficulties; it is an effective sorter, evaluator, and adjuster of all human problems. Religion does not remove or destroy human troubles, but it does dissolve, absorb, illuminate, and transcend them. True religion unifies the personality for effective adjustment to all mortal requirements. Religious faith -- the positive leading of the indwelling divine presence -- unfailingly enables the God-knowing man to bridge that gulf existing between the intellectual logic which recognizes the Universal First Cause as It and those positive affirmations of the soul which aver this First Cause is He, the heavenly Father of Jesus' gospel, the personal God of human salvation. 196:3.2 There are just three elements in universal reality: fact, idea, and relation. The religious consciousness identifies these realities as science, philosophy, and truth. Philosophy would be inclined to view these activities as reason, wisdom, and faith -- physical reality, intellectual reality, and spiritual reality. We are in the habit of designating these realities as thing, meaning, and value. 196:3.3 The progressive comprehension of reality is the equivalent of approaching God. The finding of God, the consciousness of identity with reality, is the equivalent of the experiencing of self-completion -- self-entirety, self-totality. The experiencing of total reality is the full realization of God, the finality of the God-knowing experience. 196:3.4 The full summation of human life is the knowledge that man is educated by fact, ennobled by wisdom, and saved -- justified -- by religious faith. 196:3.7 1. Humanitarian fellowship -- love. The purely animal mind may be gregarious for self-protection, but only the spirit-indwelt intellect is unselfishly altruistic and unconditionally loving. 196:3.8 2. Interpretation of the universe -- wisdom. Only the spirit-indwelt mind can comprehend that the universe is friendly to the individual. 196:3.9 3. Spiritual evaluation of life -- worship. Only the spirit-indwelt man can realize the divine presence and seek to attain a fuller experience in and with this foretaste of divinity. 196:3.14 Moral evaluation with a religious meaning -- spiritual insight -- connotes the individual's choice between good and evil, truth and error, material and spiritual, human and divine, time and eternity. Human survival is in great measure dependent on consecrating the human will to the choosing of those values selected by this spirit-value sorter -- the indwelling interpreter and unifier. Personal religious experience consists in two phases: discovery in the human mind and revelation by the indwelling divine spirit. Through oversophistication or as a result of the irreligious conduct of professed religionists, a man, or even a generation of men, may elect to suspend their efforts to discover the God who indwells them; they may fail to progress in and attain the divine revelation. But such attitudes of spiritual nonprogression cannot long persist because of the presence and influence of the indwelling Thought Adjusters. 196:3.17 Every time man makes a reflective moral choice, he immediately experiences a new divine invasion of his soul. Moral choosing constitutes religion as the motive of inner response to outer conditions. But such a real religion is not a purely subjective experience. It signifies the whole of the subjectivity of the individual engaged in a meaningful and intelligent response to total objectivity -- the universe and its Maker. 196:3.19 True religious worship is not a futile monologue of self-deception. Worship is a personal communion with that which is divinely real, with that which is the very source of reality. Man aspires by worship to be better and thereby eventually attains the best. 196:3.20 The idealization and attempted service of truth, beauty, and goodness is not a substitute for genuine religious experience -- spiritual reality. Psychology and idealism are not the equivalent of religious reality. The projections of the human intellect may indeed originate false gods -- gods in man's image -- but the true God-consciousness does not have such an origin. The God-consciousness is resident in the indwelling spirit. Many of the religious systems of man come from the formulations of the human intellect, but the God-consciousness is not necessarily a part of these grotesque systems of religious slavery. 196:3.31 The great challenge to modern man is to achieve better communication with the divine Monitor that dwells within the human mind. Man's greatest adventure in the flesh consists in the well-balanced and sane effort to advance the borders of self-consciousness out through the dim realms of embryonic soul-consciousness in a wholehearted effort to reach the borderland of spirit-consciousness -- contact with the divine presence. Such an experience constitutes God-consciousness, an experience mightily confirmative of the pre-existent truth of the religious experience of knowing God. Such spirit-consciousness is the equivalent of the knowledge of the actuality of sonship with God. Otherwise, the assurance of sonship is the experience of faith. 196:3.32 And God-consciousness is equivalent to the integration of the self with the universe, and on its highest levels of spiritual reality. Only the spirit content of any value is imperishable. Even that which is true, beautiful, and good may not perish in human experience. If man does not choose to survive, then does the surviving Adjuster conserve those realities born of love and nurtured in service. And all these things are a part of the Universal Father. The Father is living love, and this life of the Father is in his Sons. And the spirit of the Father is in his Son's sons -- mortal men. When all is said and done, the Father idea is still the highest human concept of God. 121:8.12. Acknowledgment:--- In carrying out my commission to restate the teachings and retell the doings of Jesus of Nazareth, I have drawn freely upon all sources of record and planetary information. My ruling motive has been to prepare a record which will not only be enlightening to the generation of men now living, but which may also be helpful to all future generations. From the vast store of information made available to me, I have chosen that which is best suited to the accomplishment of this purpose. As far as possible I have derived my information from purely human sources. Only when such sources failed, have I resorted to those records which are superhuman. When ideas and concepts of Jesus' life and teachings have been acceptably expressed by a human mind, I invariably gave preference to such apparently human thought patterns. Although I have sought to adjust the verbal expression the better to conform to our concept of the real meaning and the true import of the Master's life and teachings, as far as possible, I have adhered to the actual human concept and thought pattern in all my narratives. I well know that those concepts which have had origin in the human mind will prove more acceptable and helpful to all other human minds. When unable to find the necessary concepts in the human records or in human expressions, I have next resorted to the memory resources of my own order of earth creatures, the midwayers. And when that secondary source of information proved inadequate, I have unhesitatingly resorted to the superplanetary sources of information. 121:8.13 The memoranda which I have collected, and from which I have prepared this narrative of the life and teachings of Jesus -- aside from the memory of the record of the Apostle Andrew ------ embrace thought gems and superior concepts of Jesus' teachings assembled from more than two thousand human beings who have lived on earth from the days of Jesus down to the time of the inditing of these revelations, more correctly restatements. The revelatory permission has been utilized only when the human record and human concepts failed to supply an adequate thought pattern. My revelatory commission forbade me to resort to extrahuman sources of either information or expression until such a time as I could testify that I had failed in my efforts to find the required conceptual expression in purely human sources. 121:8.14--- While I, with the collaboration of my eleven associate fellow midwayers and under the supervision of the Melchizedek of record, have portrayed this narrative in accordance with my concept of its effective arrangement and in response to my choice of immediate expression, nevertheless, the majority of the ideas and even some of the effective expressions which I have thus utilized had their origin in the minds of the men of many races who have lived on earth during the intervening generations, right on down to those who are still alive at the time of this undertaking. In many ways I have served more as a collector and editor than as an original narrator. I have unhesitatingly appropriated those ideas and concepts, preferably human, which would enable me to create the most effective portraiture of Jesus' life, and which would qualify me to restate his matchless teachings in the most strikingly helpful and universally uplifting phraseology. In behalf of the Brotherhood of the United Midwayers of Urantia, I most gratefully acknowledge our indebtedness to all sources of record and concept which have been hereinafter utilized in the further elaboration of our restatement of Jesus' life on earth.